When cancer develops in the lungs, it is known as lung cancer. When it develops on melanocytes, it is referred to as melanoma. Melanocytes are certain cells that make the skin, eyes and hair look like they do. They produce a substance known as melanin, which basically is skin pigment. 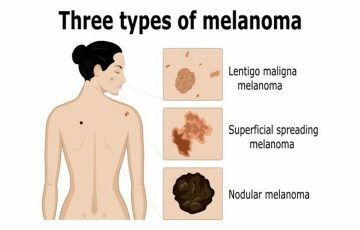 There are several types of melanoma. The types are discussed in this article. 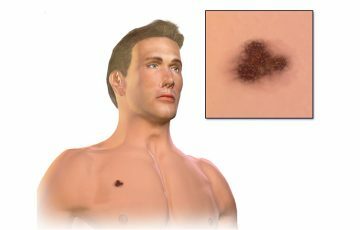 See pictures of melanoma for illustrations. 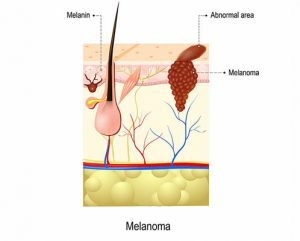 Melanoma is a cancer that develops on the skin, in the melanocytes to be specific. 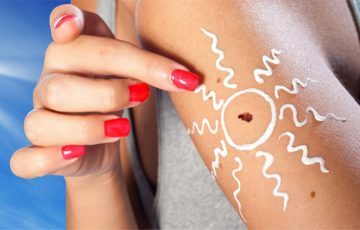 Other than melanoma, there are two other types of skin cancers. 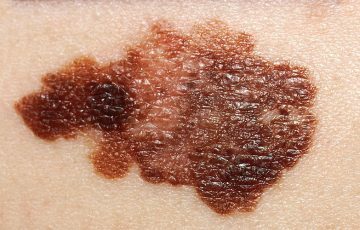 Melanoma is of the three most aggressive, deadliest but rarest. 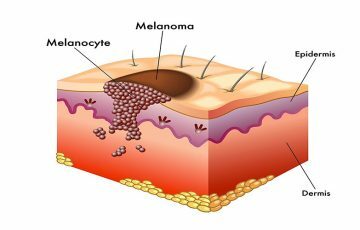 Although only about 15% of all skin cancers are caused by melanoma, it accounts for about 65% of all deaths due to skin cancer. 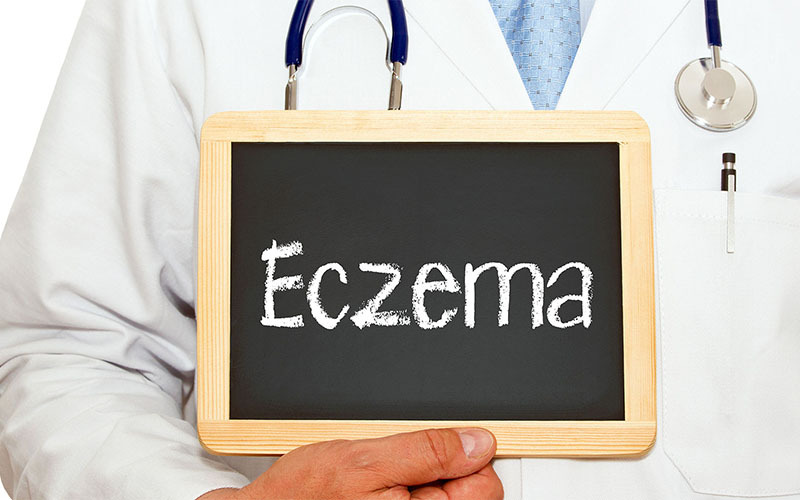 Mostly appears as a spot or blemish on skin which tends to spread across the skin before penetrating into the dermis. The type gets its name from its tendency to form red nodules. The nodules spread into deeper skin layers very rapidly. This type is considered the most invasive. This type occurs on soles of feet and palms. 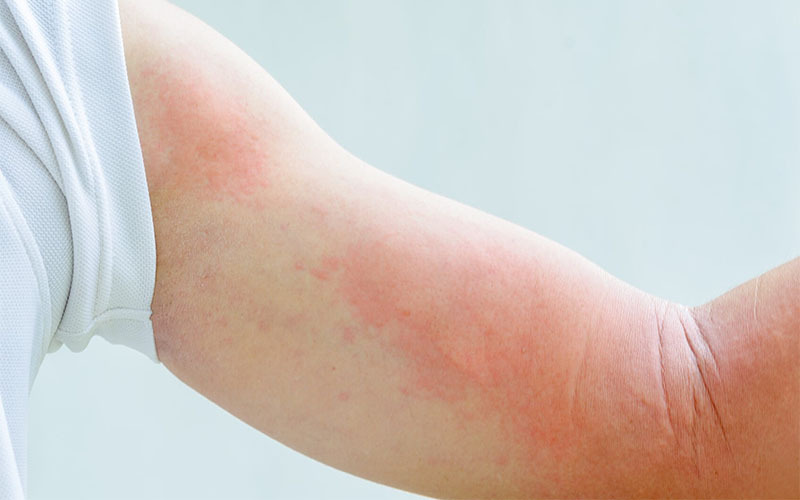 It is characterized by a flat discolored spot or patch. The patch may linger for a long while before spreading. This is the most common type in older people but perhaps the rarest of all types. It begins on the skin in the form of a discolored slow-growing patch or mole. 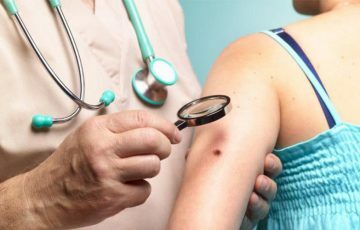 Malignant melanoma – here, melanoma cells often break free from a primary tumor, enter blood or lymphatic vessels, migrate and invade other organs. This type can also be referred to as metastatic melanoma. Ocular melanoma – this type develops in the eyes, mostly in the uvea. A common subtype is choroidal melanoma which develops in the choroid. 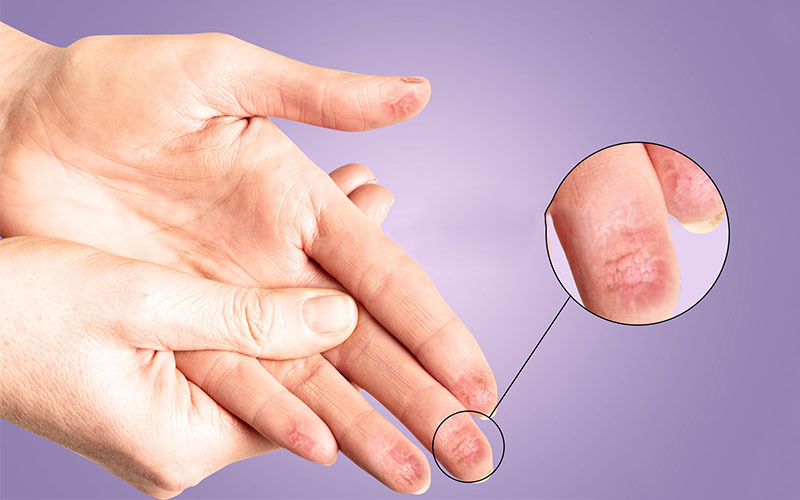 Subungual melanoma – develops in the nail matrix, nail plate or skin areas surrounding the nail matrix. Statistics keep changing now and then. WHO estimates that about 130,000 cases of melanoma occur every year. The number is expected to rise as more UV radiation reaches earth’s lower atmosphere due to ozone depletion. More men develop melanomas of the head and neck areas that women. The opposite is true for melanomas of the legs. 5-year survival rate for in situ melanomas is about 80% or more. Once tumors have spread to lymphatic system, the percentage drops to about 50% and below 20% after distant metastasis. Sun is the largest source of UV rays. 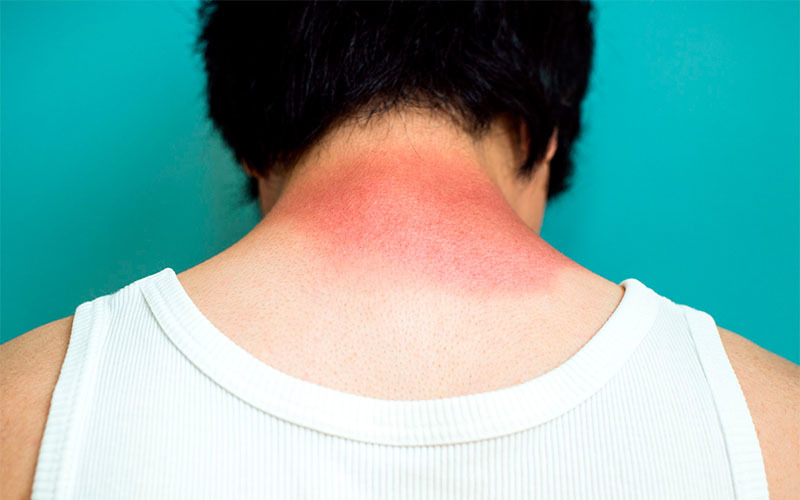 People with a history of sunburns and related conditions are more prone to developing melanoma. Some artificial devices such as tanning beds also emit UV radiation. It is quite rare to find melanoma in children, especially in the head and neck areas. More cases are reported in people above 60 years of age. Regardless, the disease can affect anyone. 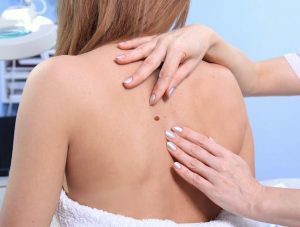 Australia is one of the countries in which many cases of melanoma are reported. This attributed to the country’s hot climate and the fact that people there are fair skinned. Additionally, there is about 10% higher risk of developing the disease if you have a close relative diagnosed with the same. 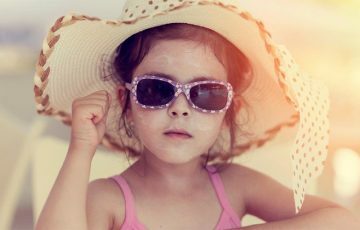 Melanin protects the skin from UV poisoning. Fair skinned people have less melanin and therefore at higher risk of developing melanoma. This is also true for people with blue eyes. 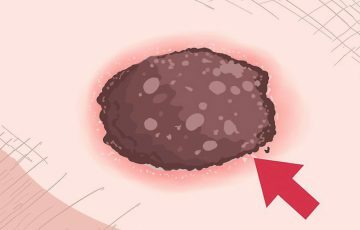 Although atypical moles are benign, some tend to develop into melanoma. 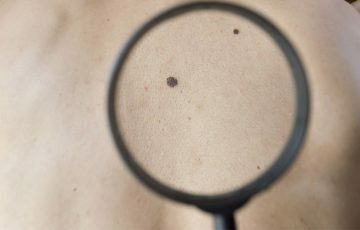 Most melanomas appear on skin and resemble moles or skin blemishes. The ABCDEs are popularly used to identify what may be early melanoma signs. A line of symmetry divides something into two equal halves. This is possible in normal moles. Malignant ones are often irregular in shape, such that no symmetry can be obtained. Moles are usually round or oval in shape. The shape is marked by clearly defined edges. For malignant ones, they can take any irregular shape. The borders do not follow any consistency. Dark-brown or red is the usual color of moles and most normal skin blemishes. When some blue, orange, green or white (for oral blemishes) occurs, it is a possible indication of malignancy. Some people have moles as large as a pencil eraser. More than 20 of them can develop, mostly before adulthood. Any mole that gets bigger than 5 mm or gradually spreads across the skin should be checked. Changes in physical features of a mole or spot on skin are not good indications. Rarely will major changes occur in how a normal mole measures, looks like, feels like or is shaped like. Such changes are common indications of malignancy. Other than these general symptoms, specific types of melanoma will exhibit specific symptoms. 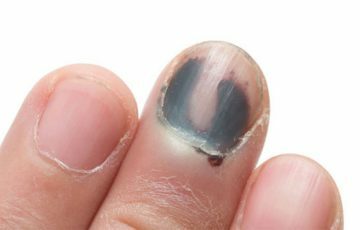 For example, acral lentiginous melanoma begins as a longitudinal streak in nail matrix. Ocular melanoma can be indicated by symptoms such as seeing shadows or flashes, blurred vision or changes in position or shape of iris but mostly the pupil. Melanoma that develops in mucosal membranes may be indicated by signs such as bleeding, nasal blocks, vaginal discharge or presence of a lump that doesn’t heal. A doctor checks for signs of malignancy using the ABCDEs. For ocular melanoma, a magnifying lens or a bright light will be used for better view. Biopsy is the most accurate test with which to confirm melanoma diagnosis. Here, a small tissue is extracted from the affected organ and checked for melanoma cells under a microscope. Most doctors prefer excisional biopsy for more accuracy. Imaging tests such as MRIs and CT scans produce images and pictures of the organ on which a melanoma tumor has developed. 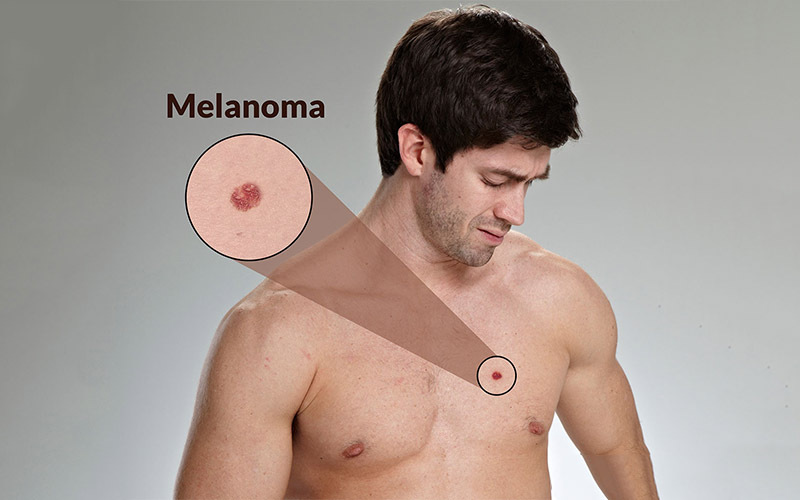 This helps set melanoma stage and also identify the extent to which the tumor may have spread. Other tests such as angiogram and sentinel node biopsy depend on the type or stage of melanoma in question. Doctors usually discuss them with patients. This is usually the primary treatment of choice. In most cases, surgical excision is used. Here, an excisional margin which depends on the thickness of the tumor is first made with help of imaging tests. An excision is then made, through which the tumor is cut out. It is a very effective melanoma in situ treatment. After the operation, radiation doses may be administered to ensure complete removal of malignant cells. Surgery can also involve amputation or complete removal of an organ or tissue. 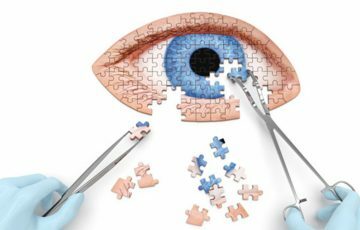 For example, ocular melanoma treatment may involve removing the entire eye. During radiotherapy, X-rays are focused on malignant tumors. The high-powered rays work by damaging the DNA structure of melanoma cells. Once DNA of a cell is damaged, the cell cannot function properly and mostly ends up dying. Radiotherapy is commonly used to shrink tumors and stop them from spreading rather than for completely removing them. Drugs used in chemotherapy work by destroying cells with a characteristic of rapid cell division. Most cancer cells divide very rapidly. The main problem associated with this treatment is that it also ends up destroying some healthy cells too. Once tumors have been treated with chemo drugs, they sometimes develop resistance to the drugs. 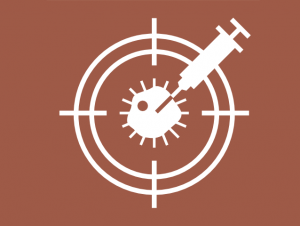 To address the issue of drugs also destroying healthy cells, targeted therapy was developed. In this case, drugs are used to target specific functions of cancer cells. This interferes with the way the cells bind to specific enzymes, inhibiting their normal functions in the process. It is a very powerful form of treatment which works even for tumors too small to be mapped by imaging tests. The immune system is able to identify and destroy abnormal cells in the body. One way this is achieved is by triggering a process that sees cells ‘commit suicide’ when something goes wrong in their DNA. Conditions or diseases that weaken the immune system make it hard for the body to protect itself from cancer cells’ invasion. To address this issue, immunotherapy has been developed. Here, drugs are used to boost the immune system’s ability to fight melanoma cells. Introduction of immunotherapy is one of the reasons why survival rate for melanoma has risen in the recent past. Melanoma in lungs or brain for example has poor prognosis than melanoma on leg. For one thing, it will be challenging to access the tumor for surgical excision. Apart from that, it is not always guaranteed that the tumor will not be in a delicate location which may not allow for a surgical operation or use of radiation. The much a tumor is determines how big the excision margin will be. Thicker tumors call for bigger margins. Unless the tumor is in body parts such as the leg which can allow for big excisional margins, it will be very hard to remove the same. Large tumors are common choroidal melanoma prognosis complications. Drugs used in chemotherapy, targeted therapy and immunotherapy produce a number of side effects. Not every patient’s health status will be in a position to handle such side effects. Moreover, some people respond very well to such drugs while others show a form of intolerance. Most melanomas occur after the age of 50. It is common for aged people to not respond well or be able to tolerate some drugs. Stage 1 – this represents tumors still in their primary location. Most are small and have just started showing early signs of malignancy. Stage 2 – here, tumors have penetrated below the epidermis and entered the dermis. Ulceration may be present, which makes tumors in this stage quite dangerous. Stage 3 – melanoma cells have by this time broken free from the original tumor, entered lymphatic vessels and invaded local lymph nodes. Early signs of swelling in lymph nodes closest to the tumor may be present. Stage 4 – this is the final and most dangerous stage. It represents tumors that have migrated and invaded distant organs. For example, stage 4 melanoma on scalp may invade the brain while choroidal melanoma will often spread to liver. Other more precise stages are allocated for clinical reasons. It is to be expected that melanoma on toe for example will be easier to recover from compared to melanoma on face. Such factors such as location, stage and treatments available will greatly influence the survival rate. Doctors commonly use a tool referred to as 5-year survival rate for melanoma. Basically, it indicates the percentage of people who survive for the next five years after diagnosis. Stage 1 5 year survival rate is about 90%. 50%-85%, 25%-80% and below 20% are for stage 2, 3 and 4 respectively. The most important thing is to seek medical attention as soon as possible. Nowadays, melanoma prognosis has very much improved. Early diagnosis can be improved with pictures of melanoma and information on topics such as what does vulvar melanoma look like.